Regina is a corporate lawyer with more than two decades of experience, and leads the firm’s specialised practice, Financial Institutions Group. Regina has been listed in Best Lawyers for her specialist practice in derivatives and regulatory since 2008 and has been described as “phenomenal” in The Legal 500 Asia Pacific. She has also been recognised as a Band 1 lawyer for Banking & Finance: Regulatory by Chambers Asia Pacific since 2015, and is known to be "highly experienced in the Singapore market and has her finger on the pulse of financial institutions and regulators." According to IFLR1000 (2019), Regina is recognised as a “Highly Regarded” lawyer for Banking and Finance. Recently, the fintech practice she co-heads has been ranked Band 1 in the inaugural Chambers Fintech (2019). 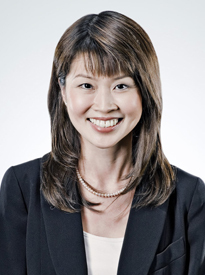 She is described as a corporate lawyer “whose expertise is sought after for intricate Singapore financial regulatory matters” and “fully fluent in the financial sector” as well as “very good at listening to and understanding clients.” Regina is recently named as a Global Elite Thought Leader for Asia-Pacific in Who’s Who Legal for Banking 2019. On an everyday basis, Regina provides key support to legal counsels and compliance professionals in banks, financial intermediaries, trading firms, investment advisers, insurance companies, lenders, payment solutions providers and other financial firms on legal and regulatory issues arising from their business and product lines including in relation to securities, futures, commodities, foreign exchange, derivatives and other investment products. Regina has also been involved in mergers and acquisitions, restructurings and other transactional matters, as well as investigations and enforcement matters relating to financial institutions. Regina liaises with regulators and industry bodies on a regular basis for specific clients or industry bodies as well as generally in relation to consultation and feedback exercises with respect to policy and legislative changes. Advising various banks in Singapore in relation to the rate-fixing scandal in Singapore and assisting with investigations. Advised an international financial services group on novel issues in relation to the U.S. Foreign Account Tax Compliance Act ("FATCA") and its impact on the group's insurance and asset management business in Singapore, and led the review and revision of customer-facing and third-party facing documents arising from FATCA in these businesses in ten jurisdictions in Asia including Singapore. Assisting in the applications to secure banking and capital markets services licences, exemptions and other applications for various financial institutions. Advised on various mergers and acquisitions between various US, European and Asian financial institutions and the Singapore regulatory issues following therefrom, the most recent being the acquisition by Julius Baer of Merrill Lynch’s International Wealth Management business in Singapore and the Singapore aspects of Gain Capital’s global acquisition of GFT. Securing the first capital markets services licence in Singapore for an on-line US equity options trader listed on the NASDAQ. Securing for foreign exchanges and market operators requisite recognition to operate a futures market in Singapore. Advising Japanese financial institutions on translation of the Japanese model of buyer based receivable financing to Singapore, Hong Kong and other jurisdictions and development of documentation with respect thereto. Securing approvals from the Monetary Authority of Singapore for various US, Chinese and European financial institutions for cross-border provision of regulated financial services. Advising on exchange show cause applications and disciplinary actions for various financial institutions. Advising various Europeans and North American financial institutions on breaches of disclosure requirements and making representations to the Monetary Authority of Singapore. Advising International Enterprise Singapore on review and proposals for the Commodities Trading legislation in Singapore. Advising banks and financial institutions with respect to banking secrecy, money laundering, Asian Currency Unit and Domestic Banking Units and various legal and regulatory issues. Development of customized documentation for banking, private banking, securities and futures trading, electronic trading platforms, give-up, margin facilities, bullion trading, currency trading, commodities trading, custody, discretionary asset management, unit trust and funds documentation for local, Chinese, US, Japanese and European financial institutions, and advising both manufacturers and distributors on introducing and distribution structures. Documenting various bespoke derivative structures on customized or ISDA based terms for both corporate users and financial institutions sell side, and issuing opinions on ISDA based agreements. Advising US and UK based insurance intermediaries on exemptions for marketing offshore insurance and other insurance and financial advisory issues. Advising local, US, Chinese and Indian financial institutions on structured deposits, dual currency deposits and other structured products and developing documentation for the same. Advising local brokerages on unclaimed monies (for which there is a lacunae under Singapore law) and devising claim procedures. Advising on, and securing exemptions under the Moneylenders Act to multi-national corporates and financial institutions. Advising on restructuring of securities and futures business of US and Japanese financial institutions in Singapore. Regina has taught the non-examinable course on Module 5 (prescribed under the Notice on Minimum Entry and Examination Requirements for Representatives of Licensed Financial Advisers and Exempt Financial Advisers). She has also been a tutor for several years with the Practical Law Course for lawyers to be called to the Singapore bar and a lecturer in the teaching faculty of the Singapore Institute of Legal Education for the Singapore Bar Examination for the Advanced Corporate Practice Elective.